This is our digital edition of Emblemata amatoria by Pieter Cornelisz. Hooft of 1611, based on Hooft, Emblemata amatoria by Karel Porteman.1 In this introduction, we have limited ourselves to the essentials. Pieter Cornelisz. Hooft was born in 1581 in Amsterdam. Being the son of burgomaster Cornelis Pieterszoon Hooft (1547-1626), he was designated to play an important role in the development of the Dutch culture.2 From 1598 to 1601 Hooft travelled through France and Italy. Although the purpose of this grand tour was his education as a businessman, Hooft was especially attracted by the origins and artefact of the Renaissance culture in the countries he visited. He started his career as a poet while travelling through Europe. His first work (poems, songs and plays) were made public years later. The Emblemata amatoria was the first book of Hooft to be published - anonymously, though Hooft’s identity was quickly recovered by reading the first emblems (Zy steeckt om hoogh het hooft  and Datje mijn haet en dunckt my niet ). When Hooft died in 1626, he had written a number of sonnets, songs and plays	that place him amongg the most famous of the Dutch poets. The Emblemata amatoria was first published in 1611 by the Amsterdam publisher Willem Jansz. Blaeu, a family member of Hooft. The book then contained thirty emblems, accompanied by several love poems and songs. A reprint of the Emblemata amatoria appeared in 1618. When Hooft’s collected poems (Gedichten van den heere P.C. Hooft) were printed in 1636, the songs and poems from Emblemata amatoria were no longer included. The Emblemata amatoria must have been written after 1606. During this year Hooft studied in Leiden, where he met R.J. De Nereé. 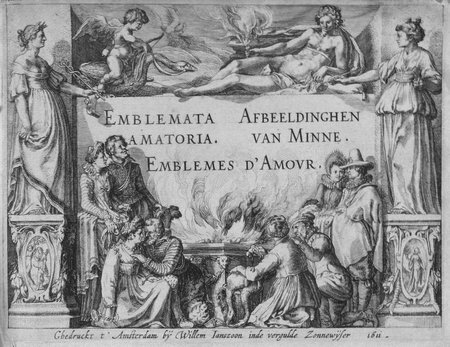 This De Nereé would later on compose the French mottoes	and	subscriptio’s for the Emblemata amatoria.3 Since the French poems show a number of similarities with Vaenius’s Amorum emblemata, it is likely that Hooft’s Emblemata amatoria was composed after 1608. The Latin mottoes and subscriptio’s for the Emblemata amatoria were made by G.C. Plemp, who befriended Hooft in 1610. Is it therefore likely that Emblemata amatoria originates from 1610 or 1611. When we compare the textual elements of the emblem books of Heinsius and Vaenius with Hooft’s Emblemata amatoria, the subscriptio’s and mottoes of Hooft, De Nereé and Plemp are remarkably short and brief. They also differ from the example Heinsius and Vaenius had given because they are not (explicitly) presented as collections of quotes from classical sources. Allthough Hooft based himself on classical and Renaissance thoughts and ideas, his sources are not as clearly marked as they were in the emblem books of Heinsius and Vaenius. titlepage must have been engraved by another engraver, since it seems to be styled in a different manner. The titlepage shows Venus and Cupido, looking down on four couples gathered around the burning altar of Venus. On their right and left they are accompanied by the muse of poetry and painting. Various other elements (such as Venus’ burning torch, the scenes depicted on the two shields on the pillars) indicate the nature of the Emblemata amatoria. The picturae can be characterized as detailed and vivid collections of classical, historical and emblematical themes. Ovid’s Metamorphoses was used to add another dimension to the relatively new tradition of love emblems. In the foreground as well as the background of a number of Hooft’s picturae scene’s from Ovid are depicted (Atalanta and Hippomenes, Syrinx and Pan, Venus and Adonis etc.). The Emblemata amatoria opens with a dedication to young lovers from Venus and Cupid.5 In this poem, the reader is first confronted with Venus, who is enjoying the power she has over both heaven and earth. Then Cupid enters the scene	and disturbs this view by showing Venus that a great number of people are not obeying her rules. He suggests that punishment is needed to straighten these people out. But Venus manages to ease Cupid’s mind. She asks him to devote himself to the education of the mankind. She assures him that writing love emblems will be just as effective as punishment. In making this edition of Emblemata amatoria we have used the copy of the edition of 1611 conserved in the Library of the Faculty of Arts of the Amsterdam University, shelf number UBM: 976 C 29 (Amsterdam, 1611). Limitations of time and resources did allow us to make a limited comparison between the Amsterdam copy and other extant copies of the book. It is clear this copy is very similar to the one described in Landwehr, Emblem and Fable Books . We have transcribed the full text from the Amsterdam copy and encoded this text using TEI markup, to allow for flexibility in presentation and non-destructive editorial enhancement of the text. The full project guidelines for transcription, editiorial intervention and indexing of the text are available elsewhere on this site. More specifically, we have added normalisations of spacing and interpunction (always allowing the viewer the option to view either the normalised or the original text). In each emblem, we also point to some literature. The full Emblem Project Utrecht bibliography may be accessed using the menu option at the left side of this (or any) window. A selection of literature relevant to Hooft and his Emblemata amatoria follows here. We would like to thank Karel Porteman, René van Stipriaan (DBNL), Paul Dijstelberge (University Library of Amsterdam) and Jeroen Jansen for their support in the making of this edition.